The Belt, waist (Mark I.) Brown leather was approved on 8 August 1901 and announced as part of the Accoutrements, naval, Pattern 1901 by List of Changes paragraph §11110 of 1st July 1902. It was described as being similar to the Belt, waist for cutlass (L. of C. §§3969, 5138). 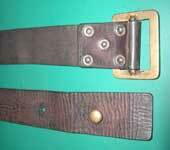 The Belt, waist (Mark I) is of simple construction and of much thinner leather than the previous accoutrements. A flat brass, single tongued buckle is riveted to one end with a leather loop riveted 6-inches away and the free end rounded to a point. At around 48-inches long by 2-inches wide they appear to have come in only one size. 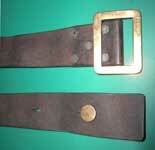 (The Belt shown in the Set Display has been shortened at some stage.) 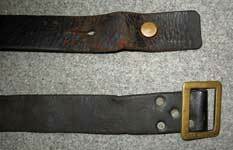 The most recognisable feature of the Belt is the line of adjustment holes that run along its centre line, at around 1 ½-inches apart, for almost its full length. These perform the dual functions of length adjustment and securing the hooks of the Braces. The example above left is dated 1902 and is by a Birmingham maker (name illegible). From the Graham Tweeddale Collection. Photographs © Graham Tweeddale 2011. The only apparent change to the Belt, waist (Mark I) was announced by List of Changes §12697 of 1st April 1905 whereby the loop was made removable so that the Pockets, cartridge, rifle, “when worn may not be forced back on the hip”. This alteration could be carried out locally as required. 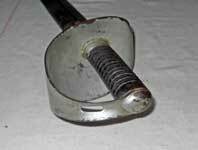 The KW team is not aware of any such belts with a removable loop, either original production or subsequently modified. Does any KW reader know of one? No Belt, waist. (Mark I.) has been noted with a production date later than 1918. This 1917 dated example by maker "R. W. Stilby" is from the Chris Pollendine collection. Although it was manufactured well after L. of C. §12697 announced the running loop, the loop on this example is fixed, as per the original pattern. Photograph © Chris Pollendine 2011. The Braces, pairs (Mark I.) Brown leather were approved on 8 August 1901 and announced as part of the Accoutrements, naval, Pattern 1901 by List of Changes §11110 1st July 1902. They were described as differing from the previous pattern (List of Changes 8362, see KW Sea Service Accoutrements section) in having both ends fitted with hooks, the front ones taking the place of the rings & buckles. The description also stated that “The braces cross at the back through a loop.” This description is somewhat of an understatement considering the Braces pairs were a total departure from previous British Service practice. The complete absence of buckles makes them somewhat unique in this regard. As with the rest of the Naval Accoutrements pattern 1901 the Braces pairs are made of thinner leather than the previous pattern. The Braces are 40-inches long with 7/8-inch wide ends tapering out to 1 ¾-inch wide for the shoulder section. As stated in the L. of C. they cross over at the rear and below the crossover point, which is fixed, are riveted two tabs which hold the ring to which the strap of the Cover, mess tin attaches. Each end is furnished with a brass hook held in place by a brass fitting secured with a pair of brass rivets. The front ends have an additional hook attached to a 2 ½-inch long free running tab. The hooks are free to rotate within their fittings. The rear hooks attach to the Belt, waist while the front hooks fit trough the adjustment holes in the Brace after the ends have been fed through the dee of the Bag, ammunition. This gives the length adjustment and takes the weight of the Bags. The hooks on the tabs, meanwhile, are attached to the Belt, waist to stop sideways movement of Braces (see detail photo, near left). When used with the pistol equipment the set up is slightly different as neither the Case, pistol or the Pouch, cartridge, pistol have a dee on them, so the weight is taken by the tabs hooked into the Belt, waist. As flimsy as they may seem, the design must have proved satisfactory as there appears to be no further L0C entries concerning the Braces, pairs. The first illustrated example is NSC (Naval Service Canada?) marked & made by "Riley & McCormick. Ltd. Calgary - 1915". From the Graham Tweeddale Collection. Photographs © Graham Tweeddale 2011. Illustrated next is a British made pair by W. Jenkinson & dated 1916. From the Chris Pollendine collection. Photographs © Chris Pollendine 2013. The Strap, mess tin. (Mark I.) Brown leather, 25-inches by ¾-inch was approved on 8 August 1901 and announced as part of the Accoutrements, naval, Pattern 1901 by List of Changes paragraph §11110 of 1st July 1902. A plain strap with a small brass loop fitted to hang beneath it, 9-inches from the buckle end, the Strap, mess tin was destined to be the shortest lived item of the Pattern 1901 Accoutrements, being announced obsolete, as a separate article, by List of Changes paragraph §11659 of 1st July 1903. In future production it was to be part of the Cover, mess tin. (Mark I.) and §11659 stated that existing stocks were to be disposed of (presumably by stitching to the Covers?) as per the instructions to be issued by the Superintendent of Ordnance Stores. To fit the Strap the buckle end is placed under the Cover towards the front with the free end fed up between the Belt and the Cover. It is then reeved up through the ring of the Braces then back down though its own loop, before being fed through the leather loops on the top & front of the Cover and buckled. The KW team has been unable to locate any photographs of Strap, mess tin as a separate item. The illustrated example is part of a Cover, mess-tin from the Ed Storey collection. Photograph © Ed Storey 2011. Once again we appeal to the KW readership for help in locating an example of an original unattached Strap. The Becket, sword. (Mark I) Brown leather, was approved 8 Aug 1901 and announced, under the title of Accoutrements, naval pattern 1901,by the List of Changes §11111 of 1st July 1902. While the rest of the accoutrements, introduced in the preceding entry, were entirely new patterns, the Becket, sword, like the Sling, rifle (Mark I) announced with it, was simply an earlier pattern renamed to be consistent with the new accoutrements. Originally known as Becket, leather, brown, sea service, sword, it was announced in List of Changes §3969 of 1880. As with many items in the List of Changes the entries for the Becket, sword are frustratingly brief! They give no indication as specific purpose or dimensions. No other official documentation has been located either, apart from an official (but low resolution, unfortunately) photograph provided by veteran KWRT member Carl Woods. If any KW reader can quote any official documentation or even anecdotal evidence of their use we would be grateful. Some theories currently proposed are that they were for securing cutlasses in the arms rack or that the Becket was a naval equivalent of a sword knot. The example illustrated is from the John Bird collection. It is constructed from a single loop of leather strip 1/8-inch thick by 3/16-inch wide terminating in a woven leather knot ¾-inch in diameter. Its overall length is 7 ¾-inches and it has neatly fitted sliding collar to allow adjustment of the loop size. It is not maker marked or dated. Can any reader confirm that this example is a Becket, sword. (Mark I)? Photographs © Graham Tweeddale 2011. The official photograph mentioned above, provided by Carl Woods. A detail view of the hilt of a Sword, Naval, Pattern 1889 | Cutlass, steel hilt, showing the slot for fitting the Becket. This Naval cutlass is maker marked "Enfield" and dated 1891. From the Karkee Web Collection. The Sling, Rifle. (Mark I), Brown leather, 39 inches by 1⅜ inches, with stud was approved 8th Aug 1901 and announced, under the title of Accoutrements, naval pattern 1901,by the List of Changes paragraph §11111 of 1st July 1902. While the rest of the accoutrements announced in the preceding entry, §11110, were entirely new patterns, the Sling [and the Becket, sword (Mark I) introduced with it] were simply earlier patterns renamed to be consistent with the new accoutrements. 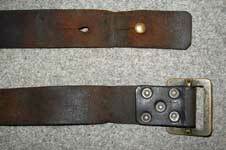 Originally known as Sling, rifle, .303 inch, brown, naval, Mark III with the added description of Leather, 39 inches by 1⅜ inches; with bronze buckle and stud; also M.H. rifle. It was announced in List of Changes § 7188 of 1890. It would appear that the 39-inches is taken when the end of the Sling is doubled over onto its stud. As with the rest of the accoutrements, there appears to be no List of Changes announcement declaring the Sling, rifle (Mark I) obsolete. Photographic evidence shows the Sling was still in use in the early 1920’s. The first example is by a London maker and is dated 1901, the maker's name being illegible. It is not however a Navy issue Sling, being one of a quantity supplied to the Queensland Police for use with their Short, Magazine Lee Enfield Mk I* and III rifles and is marked as such. For the photos at left this Sling has been mounted on a 1907 dated S.M.L.E. Mk. III made by Birmingham Small Arms, and which is appropriately marked to the Royal Australian Naval Brigade, Victoria. Both the Sling and the rifle are from the Graham Tweeddale Collection. Photographs © Graham Tweeddale 2011. The next example is by Martins of Birmingham, 1903. 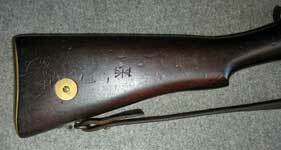 Note that this Sling does not show the necking evident in the first example, indicating that it has never been fitted to a Rifle, short, magazine, Lee Enfield with its 1 5/16-inch wide sling swivels. From the Chris Pollendine Collection. Photographs © Chris Pollendine 2011.